Finding the right balance between caregiving and work can be a challenge, especially when this means juggling multiple roles that may conflict with each other. Missed meetings, forgotten deadlines and feelings of guilt can all add up to serious stress at the end of the day. While finding balance may seem impossible, there are ways to manage your responsibilities without losing your job or your mind. Start by making sure your manager is aware of your caregiving responsibilities. Not only will this explain any changes they may notice in your work habits, but they may also be able to offer solutions for the challenges you encounter such as flex time or ample notice regarding upcoming events that require your attendance. The human resources department can provide you with information regarding your company’s leave policies that may include paid or unpaid time off to care for your loved one. They can also explain the Family Medical Leave Act and identify if you meet the requirements for eligibility that could provide you with up to 12 weeks off work to tend to a family member’s care needs. As much as you may wish that you could always be there for your loved one, the truth is no caregiver should attempt to do it alone. Reach out to other family members and friends so that you can develop a network of support that includes additional Rhode Island caregivers who can step in when you must focus on work. With the right support in place, you should be able to focus solely on work when you are at your place of employment. Try to avoid doing caregiving-related duties while you are on the company clock. When possible, pitch in on important projects, offer assistance to coworkers and express gratitude for the extra help at work so that your dedication continues to shine through. For additional support and resources, turn to Rhode Island Home Care Assistance. 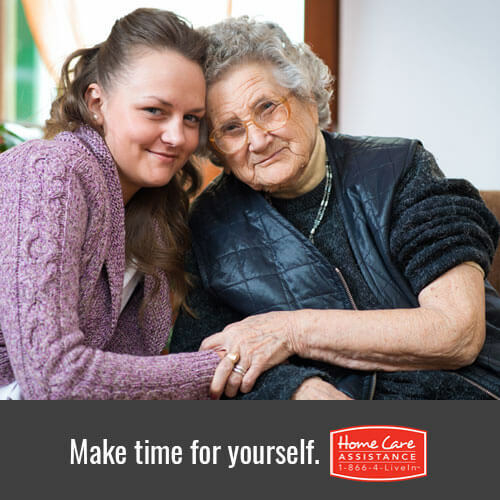 We are a trusted provider of senior home care in Rhode Island and offer flexible hourly and comprehensive live-in care, ensuring seniors have the help they need when they need it most. To learn more, call a friendly Care Manager at (401) 284-0979 and request a complimentary consultation.